Home/Information centre/Learning about surveys/What is 360 Degree Feedback? 360 Degree Feedback is a process or system for collecting feedback. It can also be known as a ‘multi-rater’ or ‘multi-source’ and can be referred to as a feedback survey or assessment. Using a 360 Degree Feedback survey is an effective way to gather feedback on a person from the people that work around them. Traditionally feedback at work is provided by a manager. This process allows people to get a holistic view of their strengths and weaknesses from the people they interact with in all areas of their work. 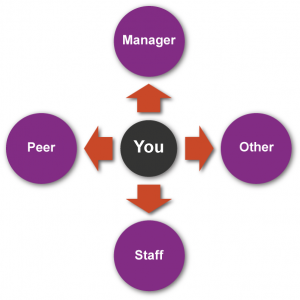 The people involved typically include a manager, staff (or direct reports), peers, stakeholders and a self-assessment completed by the employee. Firstly, we make sure we understand all of your requirements and then provide advice on the best way to deliver the project to ensure you get the results you need. We have over 15 years experience in the industry and use the knowledge we’ve learnt along the way to provide best practice delivery for you. Based on your requirements we can help customise your survey or use one of our standard survey packages. Our client services team will manage the survey process for you, start to end. The collection of the confidential feedback is conducted via our line system and our team will keep your updated on the process along the way. The feedback is generated into a comprehensive report. Our expert facilitators will help deliver the feedback for individuals and/or groups. Our facilitators review each report prior to meeting with the participant to identify development opportunities.